NOTHING like this has happened before. In the lead-up to this year’s MotorEx, Australia’s car-judging royalty has set up the first-ever organised pow-wow with a group of the nation’s top car-builders. The mission? To get to the bottom of how judges come up with their scores, that can either make winners or shatter dreams in the Elite and Street Elite categories. It’s 8.30am and we’re tucked in the back of an industrial block in Caringbah, NSW at the Protrans workshop – neutral ground. Meguiar’s MotorEx and Street Machine Summernats Chief Steward Owen Webb addresses the builders, his judging team standing behind him. Off to one side of the workshop is Terry Mourched’s Charger (SM, Mar ’14); near the roller-door is Steve Azzopardi’s XB Falcon (SM, Jun '14) – fine examples of the Elite and Street Elite categories respectively. Webb explains that to start off, the builders will get a crash course in judging. Then they are going to run a little exercise: the judges will judge the Falcon and Charger as a group and so will the builders. At the end Webb will compare the results and answer any questions that may have arisen. Street Machine is lucky enough to be the fly on the wall today so we can put together a guide to how the judging process works, along with some top tips to help you build better. As midday rolls around, the builders and judges have finished assessing the cars. The results from both teams are close. The judges give the Charger 631; the builders, 575. As for the XB Falcon, the judges rate it 580; the builders give it 500. Let’s see where the current system has come from and how it works. Meanwhile the quality of cars being built for shows was evolving, but the judging system wasn’t. The tick sheet couldn’t keep up with the advances in technology and in workmanship. To make matters worse, the tick sheet offered no real motivation for builders to take risks and think outside the square. By the late 1980s, Webb and Summernats founder Chic Henry realised the old system wasn’t good enough. “Chic and I saw that people were building cars just to win trophies – they’d tick all these things and whoever got the most points won. The old tick-sheet system meant almost anybody could call themselves a judge and mark off the checklist. Some judges were experienced car-builders; others may have simply been enthusiastic helpers. The new system of categories and weighted points requires judges with a professional understanding of car-building. 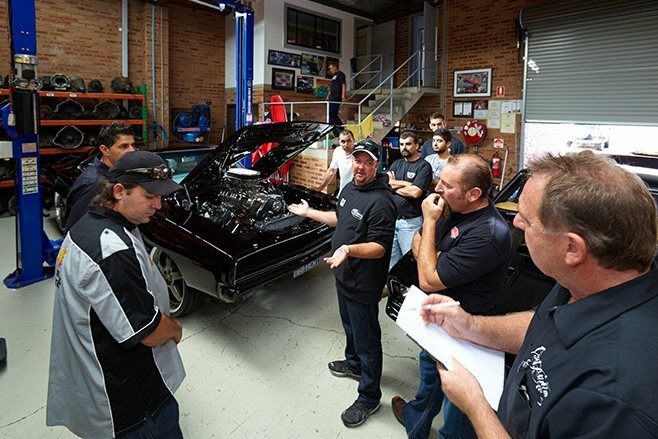 The current judging team (for both Summernats and MotorEx) has been handpicked by Webb and is made up of some of the industry’s most talented builders. Each is an expert in their own field of specialty, and based on this each is given one or more of the seven judging categories to preside over, while also having an overview of each car. As the judges are all builders themselves, there is sometimes a situation where a judge has been involved in the build of one of the cars up for judging. That person is therefore not allowed to take part in the judging of that car, nor in any discussion of it. The current system has several judging categories with points allocated to each. In the Elite and Street Elite classes there are seven categories, with a total score out of 1000. The total possible points in each category are weighted to reflect how important each one is in the public mind. Paintwork is deemed to have the biggest ‘wow factor’ and is judged out of 180 points. Bodywork is out of 170, as is Interior & Rear Compartment; Engine & Associated Components and Undercarriage & Driveline are both scored out of 140; while Overall Innovation and Impact & Display are each allocated 100 possible points. The judging process at MotorEx starts before the show, when the build books arrive. During the show the judging team goes out together, and as they move from car to car, each judge assesses their specific category only. The judges have their own individual techniques for judging, but all say they begin by standing back and taking the car in. They look at the stance and appreciate the overall impact. Then they’ll move in for the attack, which will normally mean they go straight to an area of the car they know is difficult. The sills and gutters are a typical first target. Inside, the judges are looking to see if the basics are done right. Do the stitches and pleats on the squab seat line up with those on the backrest? Are the edges of the carpet finished off properly? A build book is vital if you’re building an Elite or Street Elite car. It’s a collection of photos and descriptions of all the difficult-to-do areas of your car that aren’t easily accessible. Also include what is unique to the car, how you’ve been innovative or anything else a judge may not be aware of in the limited time they have to judge your car. The elite (or Superstars as it’s known at MotorEx) and Street Elite categories are the top two levels of the Aussie car show world. Both categories require cars to have the highest standard of quality and finish. It’s in these categories that innovation and a high degree of difficulty is expected. While both Elite and Street Elite are almost identical in the standards expected, there is one major difference. Street Elite cars do not need to have fully detailed undercarriages. These cars are driven, working machines and therefore the undercarriages will not be works of art, with the same quality paint as the outside. The whole point and spirit of the category is that these are genuine registered road cars. To ensure this, bonnet protrusions of more than 150mm and rims wider than 12 inches are now banned. Mick Fabar's ZERO'D (SM, Sept '12) was an innovative car from the concept up - the goal was to build an elite car out of largely recycled materials and a nil carbon footprint. And from there it just gets better - fitting a 7.3-litre turbo-diesel V8 is one thing, but making it look this good is another! Elite on the other hand requires fully detailed undercarriages. And if you can crank the engine that’s good enough, it doesn’t have to fire because these cars aren’t expected to be driven – they’re wild sculptures on wheels. What everyone agrees on is that you should first build a car you are happy with – building a car purely to win trophies is asking for trouble. But if you do want to build an Elite car, you need to be clear about what you are gunning for. If you want a genuinely street-driven car, Street Elite is the go. Familiarise yourself with how the judging system works and have it in mind as you are planning your build. “Too many guys put a heap of money into their car, but at the end skimp on the paint,” says Glenn Coburn. “They put in a 700hp engine when they are building something that doesn’t need it. If they stuck to 400hp, they’d have heaps of grunt and more money to put into panel and paint. 1. Rush it. The judges can spot a car that has been rushed a mile off. When you rush it you’re more inclined to miss important details. You will also not be able to spend the proper amount of time getting the difficult bits right. 2. Change your mind. As soon as you begin chopping and changing, the budget is going to blow out and you’ll end up with a car that won’t flow together properly. 3. Support group. Keep your friends and family under control. Don’t let them get you revved up. 4. Sob story. Everybody has a story behind their build; yours is not special. 5. Budget-boast. Judges aren’t interested in how much has been spent. They see the car for what it is. JUDGING METHOD: I start by looking at a difficult area – say, the radiator support, the gutters and underneath the sills. If the detail and finish is good there, then you know that that car is probably going to be competitive and I’ll need to spend the time on it. LOVES TO SEE: Innovation. It stops our industry being stagnant and innovation can be in any part of the car. I love to see people stepping outside the square and taking a risk. TOP TIP: Read the criteria. But my biggest tip is build the car you want. And then if you win something with it, it’s a bonus. The fun is in having a car, not walking away with a trophy. JUDING METHOD: I think the first thing I do is appreciate the car. Then we start to break it down and look at body, gaps, panel fit and straightness. So we’ll walk through the process of the car being built – have they thought about it from start to finish? Then we look at the paint; we look through the paint at the foundations. Is the design right, does the colour suit the car? LOVES TO SEE: People that make some brave decisions about colour and take a big risk. The whole emotion of a car is created around the colour. It highlights the styling, it highlights the panels – everything you’ve done to that car is highlighted with the right type of paint. HATES TO SEE: A real bugbear is when you can see they haven’t done enough trial-fitting of the car in the lead-up; they’ve left all the important things right to the end, rushed it. TOP TIP: Have a plan of the build drawn up well in advance. Before you turn a spanner you need to have a drawing of the car, too. JUDGING METHOD: Start with the stance. The stance is everything. How well do the wheels fit the body? Everything I’m looking at is inside and you don’t see, so basically the undercarriage is what we call the platform and if that’s wrong, everything on top of it will compound the problems. Then look at the marriage between the motor and the car – has it been well integrated? Is the position of the engine good for dynamics? LOVES TO SEE: When I know something works and it’s finished. The motor’s going to run; it’s not going to hit on anything. I know that the customer has an asset and not a liability on their hands. HATES TO SEE: Dirt! At a show like MotorEx, your car must be clean, including all the hard-to-get-to places. At Summernats, we allow for a bit of dust, as the cars have to be driven in. TOP TIP: Plan. Put a diary next to your bed and a scrapbook. Try not to do things twice. JUDGING METHOD: Instead of trying to find defects, I look for the positive things. It might be some fabrication or some modification; it might be where someone has used their imagination in a different way than other people have, so it makes them stand out. I take imagination, innovation, customisation and workmanship all into consideration. LOVES TO SEE: People using their imagination. I love seeing innovation and I love seeing people enjoying their car. panel gaps either – but at the same time I’ve never seen a car with a perfect interior. TOP TIP: Express yourself through the car. Don’t pull out a magazine and say: ‘I want to build a car just like that.’ Build a car of that same quality, or better, but always try to use your own influence on the build of the car. JUDGING METHOD: I guess the first thing I do is step back and look at gapping, then I’ll start getting to the details. And you can’t just judge the car as-is, you’ve got to compare it to the previous car; that’s how you really know how to score a car. You can’t take personal taste into it. You just have to judge it for what you see in front of you. LOVES TO SEE: Paintwork that’s been finished off really well. Detail, no edges, all gloss – that’s what really drives me. I look forward to that. I like seeing people set new limits with colour and looks. HATES TO SEE: Never try to cover up a fault, like a paint run or a chip, with a sticker or part of your display; it will just draw attention to it and we’ll see it straight away. TOP TIP: Build a car for yourself and not for a trophy.